Some of you may have accidentally encountered an obscure ‘feature’ of the program. It’s the Item Data Dump. Sometimes it pops up and startles people and they wonder what it means and how they did it. 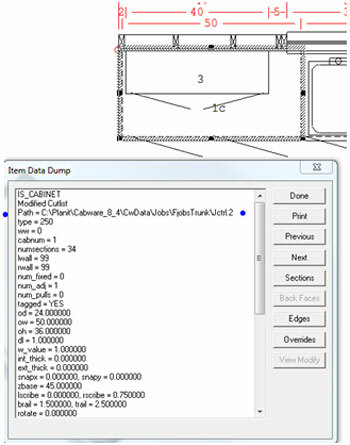 To see this ‘Data Dump’, press down on the Ctrl key on the keyboard and double click an item on the floor plan or elevation. You’ll see a dialog pop up that has a lot of seemingly meaningless information in it. Our staff use this frequently to find out details about the item selected. For example, this base cabinet that has a saved Cabinet Cutlist will show the location and name of the cut file. This may be useful at times. Particularly if there is some problem concerning the cut file. You can also track a saved Multi Cross Section file or a Saved Dynamic Multi Cross Section file this way. While the Data Dump shows a lot of information, some of it doesn’t mean much to the casual user and none of it can be edited or deleted. Sometimes being able to see the names of files or other data can be useful. Note how this 3D Object will show the actual file name it is stored with. That may help if you want to find the file in the folder to send to someone or edit outside Cabnetware. One exception to the not being able to edit the Data Dump is this important area. 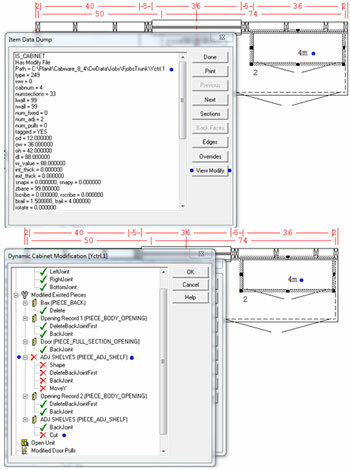 If you use the Dynamic Cross Section feature in CW 2011 R1 Ultimate, you can enable or disable the modifications you have done in Multi Cross Section. This can be very useful if there is an unexpected problem you find when reviewing the cabinet. This allows you to debug the changes one by one or in groups. You can ‘turn off’ the modification without having to eliminate all the changes. 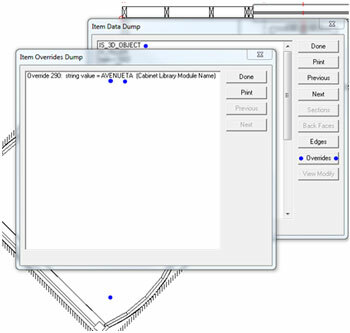 When you do the Data Dump on the cabinet with the Dynamic Multi Cross Section, you’ll have a button available named View Modify. When you click that it shows all the things in the cabinet that have been change in Multi Cross Section. You can double click on a part to toggle the modification on or off. Note the green and red marks. You can toggle an individual change on or off too. When you close the Data Dump box and review the Multi Cross Section, the items turned off are no longer in effect in the cabinet. This information may be more than you ever wanted to know, but it can be useful in some circumstances. That’s why it’s offered as a Tech Tip. The Data Dump can be found in all Cabnetware layout programs. The information displayed will vary depending on the style of program you have.